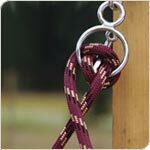 The Blocker Tie Ring allows you to regulate the amount of hold by using one or more of the three different tying options. 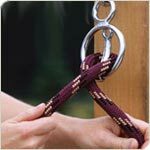 In addition, you can increase the hold by as little as a few pounds or as much as several hundred pounds, simply by changing the type of lead rope that you use. 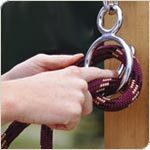 Step 1-1 After installing the Blocker Tie Ring, double-up the lead rope approximately three feet from the snap end and make a loop. Insert the loop through the large ring of the Blocker Tie Ring. Next, push the tongue of the Tie Ring up through the loop in the rope. 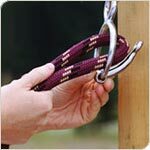 Step 1-2 Pull both ends of the lead rope straight down to lock in place. Offers more support and hold for your horse. 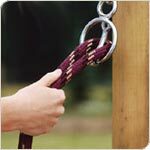 Step 2-3 Grasp the end of the lead rope that is attached to your horse and pull down to lock in place. Offers the most hold and support for your horse. 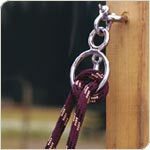 If you can’t pull the lead rope through the Tie Ring, you probably are using more hold than necessary. Step 3-1 Starting with your lead rope tied at Level Two, grasp the tail end of the lead rope that is attached to your horse. This creates the most hold possible while still allowing a release.